In order to better understand the family relations ,which at times appear to be very confusing, certain extracts of the books written on or about the families have been incorporated into this web page. It is suggested that if you are interested in the history of that period of time, whether it be Scottish, English, Swedish, European, Canadian or for that matter American you should take the time to obtain the books in question and read them in their entirety. One must realize also at this time in Scotland, the industrial revolution was beginning to run at full speed, many new inventions were coming into play that allowed adventuristic gentlemen, and others, some very unscrupulous, to embark on schemes that for some of them, made them very very rich . The majority of these families, while not belonging to the upper crust of Society, or to the Aristocracy, managed to find their own level of social interaction. Mingling, associating, and marrying amongst themselves, provided them with the ways and means of enforcing their status and increasing in most cases, their financial portfolios. What Royalty had accomplished in the past to ensure their own strong succession, was now being practiced several social levels below, by the rising industrial entrepreneurial class. It would be pleasing to the mind to have read in the multitude of documents written of the history, of Scotland, England, Canada, Sweden, Austrailia and New Zealand, that the Macfie family, or individual members there of, played some important role in the development of things , however this was not the case. Alas, we may only claim small mentions in the records of those families who did play roles ( some of the roles, being major roles) in the development of the above mentioned countries. Certainly we are assured that the Macfie family would have been well aware of the ideas, projects and developments that were being put forth, which would have a major bearing on the future relations of these countries and their friends and foes. It is very difficult to image, that the Macfie family did not embark upon, nor join forces with these interconnected families in projects that would surely have enriched their personal family fortunes. What would have been the out come of the family today had the Macfie Family joined with the Fairrie Family, to form a sugar conglomerate, then joined up with the Thorburn Family to form a Sugar and Tea importing - exporting conglomerate, then joined with the Allan Family to develop the ideal transportation system and finally join with the Galt Family to develop the hinterlands of Sweden ,Canada, Australia, and New Zealand. Had the principles of big business been then, what they are now, one can only imagine what could have happened. The following families have been protrayed as best as possible, not all the interconnecting families have been researched, and hopefully as they are found, the necessary changes to this site will be made . The book titled " Ravenscrag ' / The Allan -Royal Mail Line by Thomas E Appleton , 1974 , provides much of the family information that is depicted here. Further confirmation of the closeness of some of the Macfie branches and the Allan family was made by Elizabeth Normand, of the Isle of Mull, Scotland daughter of Sheila Elizabeth Allan . (circa 1993). Also consulted were many other works , historical and others that have been published regarding this famous family. According to the 1861 Canada Census Elizabeth Allan was 14 years old and Jean Crawford was 12 , neither girl was listed on the 1871 Census so it is possible they had both died sometime before. It is with much regret we intimate the death of Mrs Macfie, wife of Claud Macfie, of Gogarburn, Midlothian. Which occurred on the 16th instant. Mrs Macfie had been ailing for some time, but was thought to be recovering, and no danger was apprehended until the day on which she died. So recently as the 4th of this month, she had remitted to the secretary of the League Mr Macfieï¿½s annual subscription and her own, and payment for the Advisers and other periodicals which her husband and herself sent to a number of schools in different parts of Scotland for free distribution among the scholars. The deceased lady was of exceedingly amiable disposition, distinguished by an inborn courtesy and sensitive consideration for all around her, and was thus much loved by a large circle of friends, who will deeply mourn her departure. Endowed wit ha deeply sympathetic nature , and inspired with the spirit of Him who went about doing good, Mrs Macfie was profoundly interested in all philanthropic and Christian agencies which seek to promote the well being of the community. In various associations in and around Edinburgh she was a highly-valued and zealous worker, and gave liberally of her means for their support. Many among the poor in her own immediate neighbourhood will sadly miss her kindly presence and sympathising words, which enhanced the value of the benefactions she was ever ready cheerfully to bestow. Mrs Macfie was early identified with the temperance movement. For about forty years she was a warmly-attached member of the Scottish Temperance League and a most generous subscriber to its funds. By various methods and in a most liberal spirit, she sought to advance the total abstinence cause. The great reform that Mr. And Mrs. Macfie originated in the island of Islay affords a striking illustration of meritorious and successful work. For about five years, from 1857 to 1861, Mr and Mrs Macfie resided in Islay House, which became the centre of a most remarkable total abstinence movement, which extended over the entire island, and embraced a large proportion of its inhabitants. Mr. And Mrs. Macfie engaged agents of the Scottish Temperance League who addressed large meeting in the different localities with wonderful effect. Clergymen, teachers, farmers, and other came forward and took the pledge, total abstinence societies were formed, the children marched in procession from the schools to the place of meeting , and large additions were made night after night to the ranks of abstainers. The temperance advocates were hospitably entertained by Mr. And Mrs. Macfie at Islay House and were conveyed by them to the different villages and clachans to address the people on, to them, the novel doctrine of abstinence from alcoholic liquors. The Beneficent work thus initiated by Mr. And Mrs. Macfie in those bygone years took firm root and bears visible fruit to this day, there being many staunch and zealous temperance reformers in the island. The efforts of Mr and Mrs Macfie for the good of the inhabitants were not restricted to the promotion of the abstinence cause. The also manifested the liveliest interest in the schools in Islay, and monthly supplies of the Adviser and other temperance publications were and are still sent for free distribution among the children. The older inhabitants cherish grateful memories of the considerate kindness of Mrs Macfie during the years of her sojourn among them. Many a public cause in Scotland and elsewhere will suffer by her death, and in private circles more especially, she will be sorrowfully missed. Mrs Macfie was a sister of Mr Alexander Allan, of the Allan Line, and the fact that Mr and Mrs Allan are now abroad imparts a peculiar feeling of sadness to the melancholy event. With Mr Macfie and the wide circle of relatives we deeply sympathise in the sore bereavement they have sustained in the death of one so much esteemed and loved. Robert named his last children after his father David and his mother Mary Walker. It would appear that his first children Robert and Eleanora Blair were named after Robert's wife's parents , Richard Brown and Eleanora Blair ( married 1785). In his book H B Timothy writes " Galt's name and that of his birthplace are connected with an event which helped to make both maritime and Canadian history. On June 1, 1819 the Jean , a square sterned carvel built brigantine with one deck and two masts, sailed on her maiden voyage from Greenock. This famous vessel, which in her time held the record for the fastest crossing from the Clyde coast to Quebec and was for several years one of the main connecting links between Britain and the Canadas was built at the Irvine shipyard by Gilkison, Thompson and Company. The Gilkison member of the firm: James Gilkison shipmaster of Irvine, who was one of the vessel's owners; and her captain, Alexander Allan , of Saltcoats in the parish of Ardrossan, were all relatives of John Galt. Thomas Galt had entered into partnership with his brother John in 1809 , however following an unexpected turn of events, Tom decided to seek his fortunes in Honduras and left Scotland May 18, 1809. He remained and died at Honduras leaving no family. The Galt family arrived in New York in mid March 1828, where John met them and brought them first to a house at Burlington Bay, then about September 1828, the family took up permanent residence in the renovated Priory at Guelph, Ont. The three boys were sent to boarding school in Chambly, Lower Canada. Due to the circumstances of John's function with the Canada Company, however the family was obliged to return to England and in June 1830 were established at 29 Halfmoon St . London England. ( at a cost of two hundred and fifty guineas per annum). Seeking to solidify his expenditures, the family moved soon afterward to Old Brompton and took up residence in Barn Cottage. John Galt's three sons decided themselves that the possibilites in Canada were endless and they could not do wrong by returning so in early 1833 John and Thomas , left, John to a farm at Goderich where he later became Register of Huron County. Thomas put in six years at the Toronto headquarters of the Canada Company, then turned to the study of law and went on to become Chief Justice of Upper Canada (Ontario). Alexander Tilloch, took leave in 1834 , was nominated for junior clerkship in the office of the British American Land Company at Sherbrooke, Lower Canada ( Quebec), rose to the position of Commissioner , become involved in the county's politics and is well know as one of the Father of Confederation of the Dominion of Canada (1867). On the 25 of March 1834, the Galts left Barn cottage with the intentions of taking up a holiday or recuperation period ( John Galt was now suffering from various afflictions) at the home of his father at the corner of Blackhall and West Burn St in Greenock, which up until now was occupied by Agnes Macfie, his sister ( she had inherited the residence at the death of her parents). 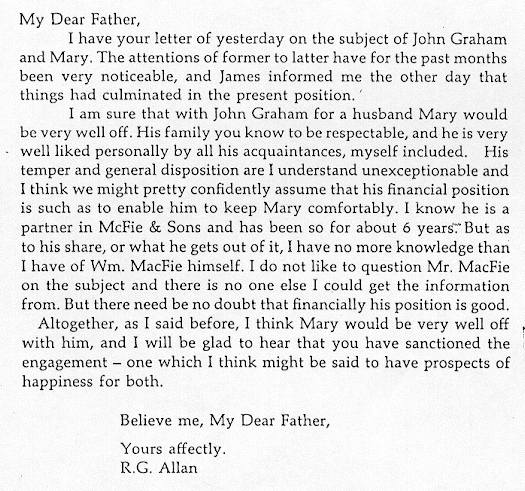 Agnes (Galt) Macfie offered to assist her brother , by giving him, his father's house, and generously allowing him half her income. Agnes Macfie by this time had already advanced to her brother and his family better that one thousand pounds. John remained only until August of 1834 in his father's home, as he found the house and garden so surrounded by buildings that he was unable to "take the air" and so found himself a dwelling at Maybank Gourock. The Hon. Thomas Galt, Puisne Judge in the Common Pleas Division, is the second son of the late John Galt, and brother of Sir Alexander Galt, of whom mention has already been made. He was born in London, where his father then lived, in August, 1815, and partly educated in England, partly in Scotland. For some time he attended an academy at Musselburgh, near Edinburgh, and was subsequently under the tuition of Dr. Valpy, known a generation ago as a popular teacher and an editor of the classics. In 1828, the family removed to Canada, and young Galt was placed under the charge of Mr. Braithwaite, at Chambly, amongst his fellow-pupils being Bishop Fuller, of Niagara, and Mr. Thos. C. Street. Two years after; he returned to the old country and spent three years there, and then returned to settle in Toronto, only a few weeks before it acquired that name. Mr. John Galt’s connection with the Canada Company afforded an opening for his son, and in its office he remained for about six years. Having resolved to enter the legal profession, Thomas Galt studied under Mr. (afterwards Chief Justice) Draper, and was chief clerk for him, when Attorney-General of Upper Canada, as Chief Justice Harrison subsequently served under Sir John Macdonald. The experience thus gained, notably in criminal practice, was of essential service. In 1845, Mr. Galt was called to the bar, and at once entered upon the practice of his profession. There was much in his favour, besides the thorough training he had undergone. Naturally of a benign disposition, he also possessed a fine presence, and an attractive address. In the practice of criminal law he was amongst the foremost, and his established integrity of character secured for him the legal business of various railway and other corporations—trusts he fulfilled with scrupulous fidelity. As Crown prosecutor, Mr. Galt has been engaged in many causes celèbres in the Western Province, and conducted them with that skill and firmness, which characterize British, as distinguished from French or American conduct of criminal cases. Judge Galt, who married soon after his call to the bar, has a large family all living of five sons and four daughters. In 1858, he was appointed Queen’s Counsel, and in 1869, on the death of Judge John Wilson—a Scot of whom unhappily we have no record—was elevated to the Bench as a Justice of the Court of Common Pleas. But for a confirmed stoop in the shoulders, early acquired from study, Mr. Justice Galt is still hale and active, although he rapidly approaches the seventieth year of his age. When Mrs. Ewing of Canada was here she and the London Fairries were speaking a great deal about our ancestors in Irvine. I showed her your letter to me about the James C. Fairrie in Liverpool. She said she had heard of an Alexander Farrie, merchant in Kilbride, subscribing to a book in Glasgow in 1739. This may be the family referred to in Sheriff Blair's record where there were eight children. J. C. Farrie's father or grandfather may have been one of the eight. Mrs. Ewing wonders if the Register books in Irvine coud give some particuars of the Farrie family - I have so many present things to engage my attention that I cannot feel any or much interest in the past. Eliza Fairrie said her father told her that it was my father who changed the spelling of the name while at school - his Master said that if the word was to be pronounced long there shoud be an 'i' in the first syllable, so it was your grandfather who began to spell the name as we now do, and your Liverpool friend's spelling is the original. Andrew has gone to Beach and may have little time here on his return, so I thought it better to write this than to explain it to him. Miss Dumas gave me a note about a Spanish Galleon 'Florencia' which was wrecked off the coast of Scotland after the invasion of the Spanish Armada. The Galleon was commanded by one Fereira, a Spanish Grandee of the first class who is supposed to be an ancestor of the Fairrie family. Edward Fairrie has in his possession an old Armada Medal. Yours of the 21st came opportunely when our cousin Mrs Ewing, who is much interested in our ancestors, was here. We did not learn anything new from the papers except the doubt thrown upon the idea that the Fairries came to Scotland in the Spanish Armada. Mrs Ewing remembers Aunty Nan saying that she had in her youth waded out to a gun which lay on the shore between Kilbride and Fairlie, said to have belonged to the Spanish Armada. Now Mrs. Ewing suggests that if anyone was at leisure in London and cared to go to the British Museum, they might look at the Record of the Armada to see whether any of the vessels were wrecked on the Firth of Clyde. Geffory Fairrie begins the story of his family as follows " James Fairrie was the third bearer of the Christian name and of the third generation of the family. He went to sea with his father in 1768 at the age of thirteen. He was later given command of the "Orangefield" and soon experienced the perils and privations of the sea since England was at war with america, France Spain and the Dutch whilst he was on a voyage from Pensacola to Jamaica in 1779. The "Orangefield" was attacked and captured near Point Pedro, on the north coast of Jamaica, by Spaniards from Cuba, and James was struck by bullets in the right arm, which was later a,putated in Green Island Harbour ,Jamaica. The "Orangefield" was recaptured and James regained his ship in Montego Bay, Jamaica, in November 1779. " "In August 1781 ,James was in command of the "Dispatch" bound from London to Charlestown, Carolina but his ship was driven ashore by an American Privateer; after considerable hardships he reached Charlestown in a river ship. He left Charletown in October in the "Hope" a British Sloop of War which was bound for New York for repairs. The "Hope" had to be beached on the Island of Saplelo, off the coast of Georiga, but James eventually arrived at Savannah in an English Galley." "James got a passage in a small, armed merchantman, the "Amazon" of Dublin, bound for Jamaica from Savannah, but this ship was captured after a running fight with an American Privteer the " Marquis de Lafayette" . The .Amazon" wastaken as a prize to Cape Francois , now Cape Haitien, on the north coast of Haiti, where James and the crew ere imprisoned. Eventually he got to Jamaica in december and thence back to the Clyde in July 1782." "James continued his seafaring life for some further 25 years, during which he spent the winter of 1787-1788 in Quebec, building a ship, the "Alfred" in which on her maiden voyage he carried a cargo of wheat to Barcelona. Eventually he decided that life ashore would be less hazardous so, in 1797, he purchased a site at Cartsdyke Bridge, Greenock, and erected a sugar refinery under the name "James Fairrie Company"
The Cartsdyke refinery was enlarged from time to time and in 1819, Howard's vacumn pans were installed. This was the first refinery in Scotland, and second out of London, to adopt the vacumn pan. In 1846, the refinery was destroyed by fire and never rebuilt. During the period 1837-1839 James Fairrie & Company rented a refinery at Shawswater in Greenock. In 1845 they purchased a refinery in Ker Street which had been erected about 1831. They made additions to the site in 1846, 1847, 1852 and 1853, and on the death of thomas Fairrie in 1858 the refinery was sold to The Greenock Sugar Refining Comapny which ceased operating in 1865. It was then purchased by Abram Lyle, John Kerr and other who had founded The Glebe Sugar refining Company in that year. The Watt Library in Greenock provided many more children and dates of birth, than do the IGI records, the 1881 British census helped a bit but with out the names it is hard to complete this family.. According to IGI records there were 11 children, notes from Watt Library, Greenock , have only 10 children listed and not all the dates match the names.